When the Turkmen Soviet Socialist Republic was invented in 1925, the literacy rate among its mostly nomadic population was somewhere between 2-3%. By 1970 not only had universal literacy been achieved, but the country had acquired its own national literature and mini-canon of “great authors,” many of them writing in forms—novels, plays, film scripts—that had been alien to Turkmen culture fifty years earlier. These masters enjoyed many privileges under the Soviet system: large print runs, the translation of their works into the other languages of the USSR, plus spacious apartments and trips to exclusive resorts. During perestroika the capitol Ashgabat boasted 12 bookshops; there were also 25 large libraries, of which the grandest was the Karl Marx library, which contained no less than four million books, all available for free to the local populace. The library was even the central image on the cover of the official guidebook to the capitol. It was a golden age of reading. Flash forward to 2001, however, and the situation was very different. This was the year that the country’s megalomaniac leader Saparmurat Niyazov a.k.a. 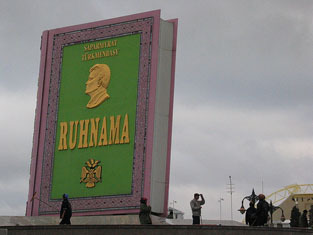 Turkmenbashi published his Ruhnama (“Book of the Soul”), a rambling concoction of autobiography, bogus history, moral platitudes and appalling poetry. The Ruhnama soon became (literally) required reading as schoolchildren, university students, government workers and anyone planning to take his driver’s test had to prove their knowledge of the gibberish between its covers. It was displayed alongside the Koran in mosques; it was launched into space. Read it three times and you were guaranteed entry to Paradise; criticize the book and you’d spend five years in jail. In spite of all his success, Turkmenbashi remained jealous of literary rivals. New books by authors popular under the Soviet regime went unpublished, while their older works were available only second hand. Anyone who tried to circumvent these restrictions landed in hot water. For instance, Rahim Esenov the author of 30 books during the Soviet era was forced to publish his three-decades-in-the-making historical epic The Crowned Wanderer in Moscow in 2003; when he attempted to smuggle 800 copies into Turkmenistan he was accused of “inciting hatred” and placed under house arrest. International pressure got him to New York to receive the PEN “Freedom to Write” award in April 2006, but his book remained banned at home. In February 2006 meanwhile Turkmenbashi declared war on authors of the past: “Nobody reads books, people don’t go to libraries,” he declared. “Central and student libraries will remain; the remainder need to close.” But the war on reading had begun much earlier, specifically in 1993 when Turkmenistan had switched from the Cyrillic to the Latin script. At a stroke, all new books were rendered inaccessible to the older generation, while older books became inaccessible to the younger generation. And with Russian language education on the decline, books in that language were increasingly indecipherable. The nearly five million Turkmen were left with the solipsistic ramblings of their “father”—who continued to churn out volumes of poetry, history and even a sequel to the Ruhnama before he died in December 2006, only to be replaced by his personal dentist, Gurbanguly Berdymukhammedov. The president even received an award. Also prominently featured was his epic work on Akhal Tekke horses which has already been snapped up by the Ukrainians. But then, the world was also very excited by the Ruhnama, but it usually had little to do with the quality of the book, and a lot more to do with flattering the local Khan in exchange for lucrative business contracts. Daniel Kalder is the author of Strange Telescopes. Visit him online at www.danielkalder.com. VISIT: The homepage for the Turkmenistan International Book Fair. READ: Entirety of the Ruhnama Vol. 1 online. BROWSE: A New Yorker article discussing novelist Rahim Esenov’s 2006 visit to the United States.